With JANICE BUSOVNE Connections Run Deep. Janice is also an avid tennis player who plays in several leagues throughout the week. Connections have always been an important part of Janice Busovne’s life. Whether it’s the quality relationships she builds with people or the inspiration she draws from having a wonderful community to call home, she loves staying connected. “I’ve found such a great lifestyle here on the Emerald Coast, I want to do anything I can to make a positive difference for others throughout the area,” Janice says. Janice grew up in a military family. She always thinks it’s funny that they ended up here in Niceville because her father was actually in the Army. They moved around a lot throughout Janice’s childhood. Her father had done some work with NATO and many Air Force veterans had told him how great a community Niceville was. So when it came time to retire from the Army, he decided to move his family to the Emerald Coast. “After a few years here, it was the first time I ever felt like I had a hometown,” Janice says. One of the most incredible experiences for Janice was the opportunity to fly “back seat” in an F-16 out of Eglin AFB. Her family was there to root her on. Though Janice enjoyed growing up in this area, she never learned to truly appreciate it until she moved away. From Michigan, where she studied automotive engineering and business management in college, to California, where she and her husband, Bernie, started their family together, Janice relocated a few times and got to see different parts of the country. But she wanted to reconnect and raise her two children in her own hometown, so they ultimately moved to Niceville and have never looked back. With the move also came a career change for Janice as she began working as a real estate professional. That was in 1997, and she’s been making a positive difference in the community ever since by connecting buyers and sellers throughout Niceville and the surrounding Emerald Coast communities. She enjoys getting involved in other ways, as well. 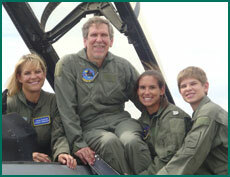 In 2008 and 2009, Janice was Honorary Commander of the 68th Squadron of the 53rd Wing at Eglin AFB. It was a great way for her to connect with local military life, and she even got the chance to ride in an F-16 fighter jet, which was the experience of a lifetime! Janice is focused on your goals and driven to help you make the most of your real estate opportunities. If you are buying or selling a home in Niceville or the surrounding Emerald Coast communities, turn to a real estate professional who’s focused on your best interests and committed to your success. Janice Busovne is Your Real Estate Connection, so call her today!